It's true benefit is being able to access Flip footage sent to you by other FlipShare TV owners, which means everyone in your circle needs to have one. What’s the best way to send HD camcorder footage to family and friends? Post a low-res version on Facebook or YouTube? Use an intermediary service such as MotionBox or You Send It? Burn your footage to a DVD and use snail mail? 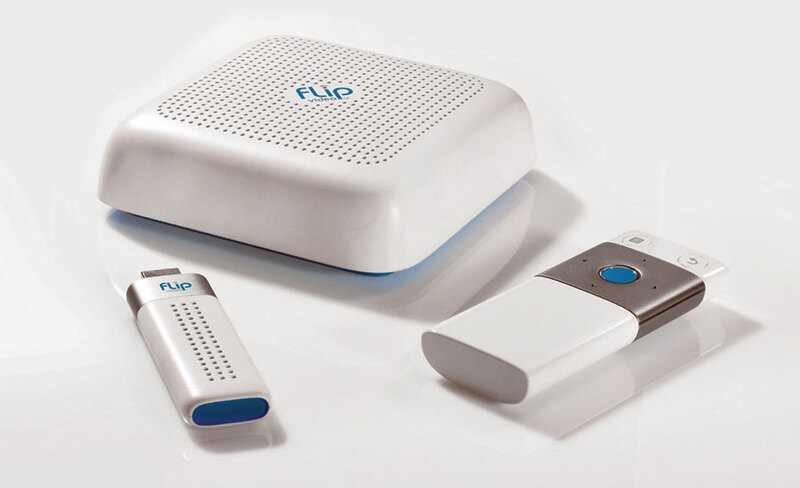 The folks at Flip feel you should use their new media bridge system, the three-piece FlipShare TV ($150), which uses a dedicated Wi-Fi connection to transmit video from your PC or Mac to your HDTV and to create a Flip Channel, so other FlipShare TV owners can watch your footage, and vice versa. While the hardware seems to work as advertised, the question is, does it kill the video sharing fly with an anvil? FlipShare TV is a pretty three-piece system finished in eggshell white with powder blue highlights: a 4.6-inch square round-cornered base unit (or console), an RF remote control, and a USB Wi-Fi key. On the rear of the console are a power jack, HDMI and component A/V jacks. FlipShare TV’s design conceit is that it creates its own private 802.11n link between the key and the console, communicating via a dual-band (2.4 GHz and 5 GHz) radio link to avoid potential interference. 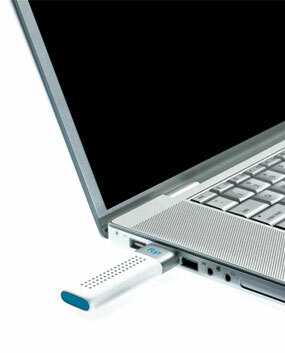 All the connecting drivers and software are pre-loaded on the key; It automatically loads onto a PC when you plug it in; on a Mac you have to double-click the app through Finder. Your footage is then transmitted from your PC or Mac via the private N network to the console, and then to your TV screen. 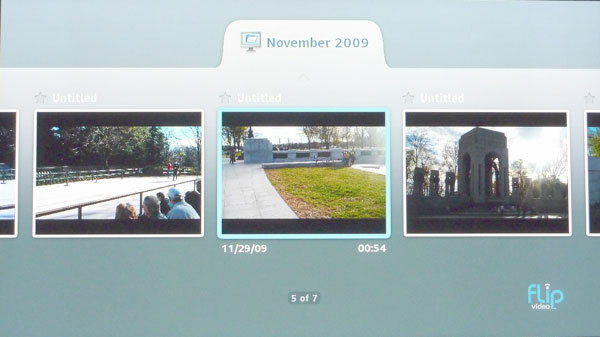 When you jack in your Flip camcorder, the controlling FlipShare video management software automatically loads. You can then transfer your footage to your hard drive, edit your footage to make more cogent little movies, create a video postcard, burn your footage to a DVD, and most importantly, create a FlipShare channel to which other FlipShare TV owners can post their footage. When you connect either a Flip camcorder or the USB key, it looks as if nothing is happening. After a few minutes, the software appears and the key begins to make its Wi-Fi connection to the console – an LED on the rear of the console turns from red to blue. Why this connecting confirmation LED is on the rear of the console instead of the front is an annoying puzzle. After that, most everything on both the PC and TV screen is simple and self-explanatory. The RF remote works from about 10 feet away from the console, and we got a solid Wi-Fi connection between the USB key and the console despite our living room being flooded by our own home network and several other media bridges in our A/V stack. Oddly, despite extensive testing by Flip’s parent Cisco, the manual warns you to keep the console an unspecified distance from other wireless or electrical devices, away from large pieces of metal, and not directly behind a flat panel TV. In other words, it works best when your TV is located in wheat field and away from everything else. Theoretically, you can import other photos and videos into FlipShare. We had no problem transferring with photos, but the FlipShare wouldn’t let us move compatible non-Flip .mov and .mpg videos. In many ways, FlipShare TV is like a videophone – you can’t really buy just one. Its true benefit is being able to access Flip footage sent to you by other FlipShare TV owners to view on your HDTV, and vice versa. To get FlipShare TV’s full benefit, everyone in your circle needs to have one. FlipShare’s dongle-and-console private network solution is clever, and works as advertised. But to us, it seems like a lot of hoops to jump through just to be able to watch home video footage on your TV, rather than a PC screen. 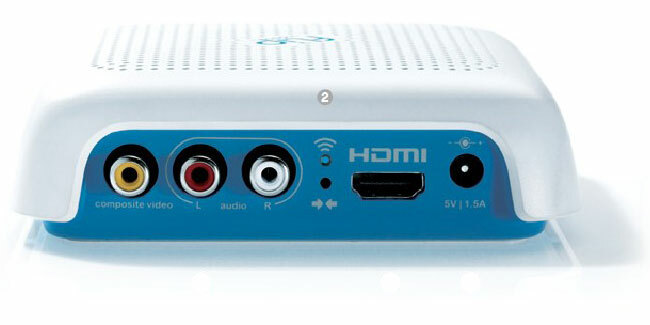 It would be far simpler – and cheaper – to simply connect your Flip to your HDTV via HDMI cable, and transmit your footage to others via other cheaper Internet video sharing, or social networking sites. It works as advertised, but we have to ask, “Why would anyone want this”?